It is easily forgotten that Prague is further West than Vienna. The geography of our imagination is a construct sometimes independent of physical reality. Until 1918, Slovakia and the Czech Republic were part of the Austrian Empire and their artists had easy access to all that was going on in Vienna and the rest of Europe. Frantisek Kupka (1871-1957) was born in Opocno in East Bohemia, and is best known today as one of the pioneers of abstraction. But ne turned in that direction when he was already past forty and had a considerable Symbolist �uvre behind him. He was a precociously gifted draughtsman, whose first lessons were from his father. He left school at thirteen and was apprenticed to a saddler. Five years later, he took classes with the Nazarene painter Frantisek Sequens, while working as a medium to supplement his funds. Sequens taught him that art must concern itself with poetic and philosophical issues. Kupka was an avid reader who devoured Plato and Mme Blavatsky, the Vedas and Schopenhauer, Bergson and Nietzsche. 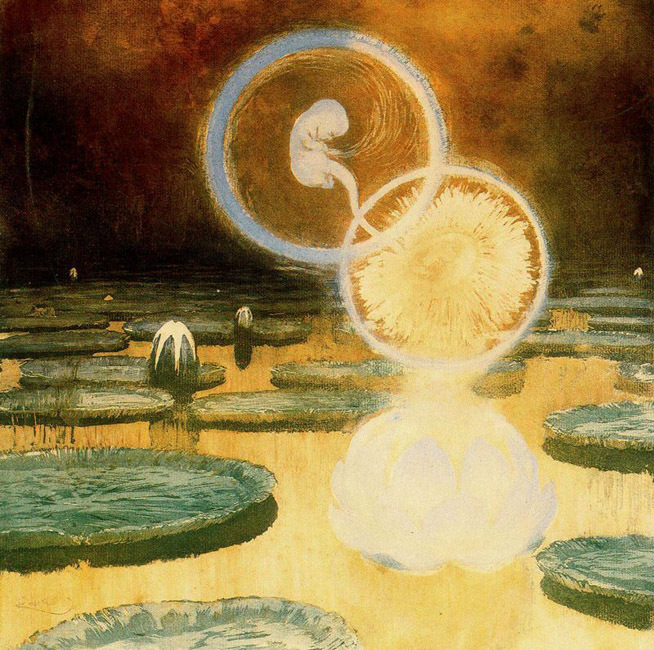 Another Nazarene painter, the obscure Karl Diefenbach, revealed to Kupka the affinities between painting and music. 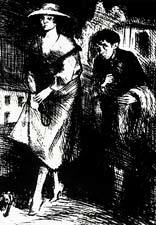 In 1895 he left for Paris, where he came under the influence of Forain, Ensor, Steinlen and Toulouse-Lautrec. Technically very able, Kupka produced works in a wide variety of styles, from political satire touched with populist irony to the grandiloquence or mysticism of the Symbolist idiom. Even within this idiom, his manner is extremely varied: decorative mysticism in The Principle of Life and dramatic fantasy in The Black Idol. The latter was clearly the inspiration for Dracula's castle in Francis Ford Coppola's film. 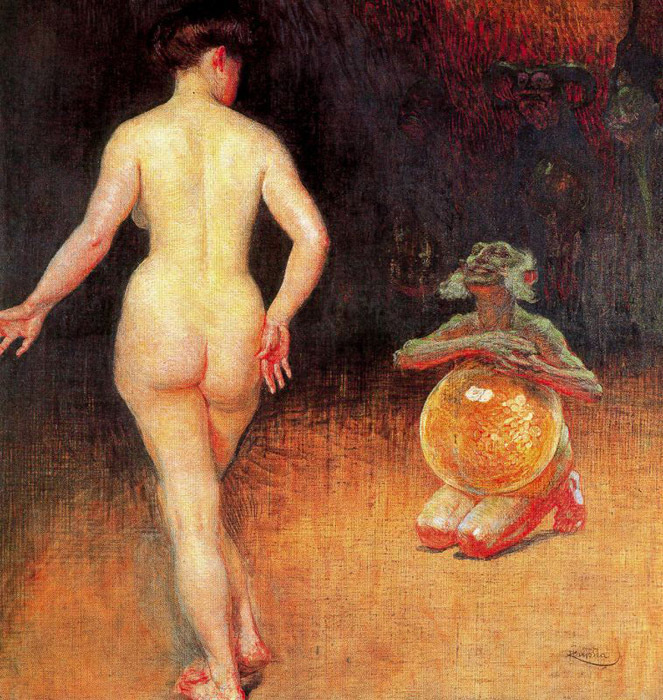 In the painting known as Epona-Ballade or The Joys, Kupka places his dark-haired companion of the day alongside an earlier mistress who had died in 1898. 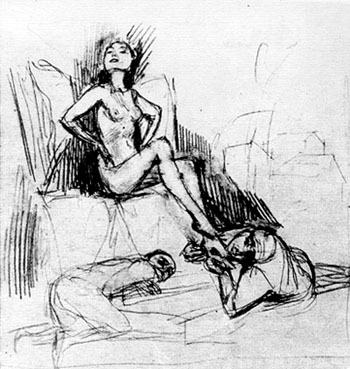 Kupka's superlative technique allowed him to work in many different styles. 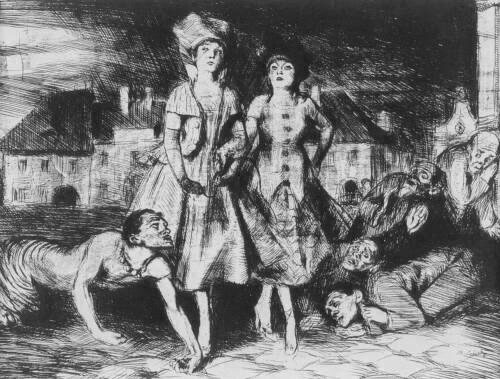 Certain of the works he painted on his arrival in Paris show a flawlessly naturalistic idiom, while the realism and irony of his line opened the way for a career like that of Felicien Rops. But Kupka was a man of very different character, and a combination of many factors -his penchant for the esoteric, his passion for music, and the impact of the 1909 Futurist manifestations - precipitated the breakthrough into abstraction. The international career of Alphonse Mucha (1860-1939) illustrates the great mobility enjoyed by artists in this period. Born in Moravia, he worked in Vienna and in Munich before moving on to Paris, where he studied at the Acad�mie Julian and ultimately won considerable success. 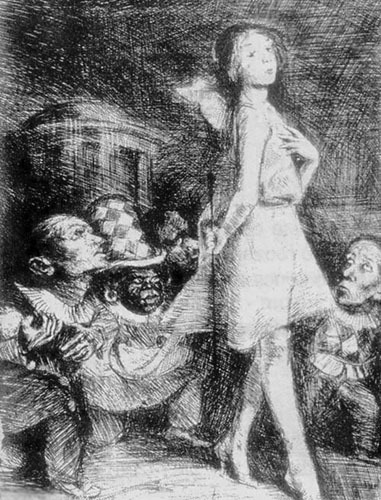 His drawings were regularly published in various periodicals including ha Plume, and he drew numerous posters for Sarah Bernhardt. He decorated the Bosnian pavilion at the 1900 World Fair and spent some years in the United States before returning to his own country, where he devoted himself exclusively to painting. Mucha was a virtuoso in many domains; he designed exquisitely intricate jewelry and his drawings and posters are the embodiment of Art Nouveau. His first commission from Sarah Bernhardt was a matter of luck. He was at his printer's workshop on Christmas Eve when news came that the famous actress wanted a poster within the next few days. All the other artists having left, the printer had recourse to Mucha, who was then unknown. The printer disliked Mucha's design, unlike Bernhardt, who was delighted with it and continued to commission work from him for many years. 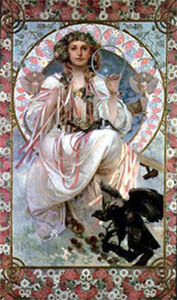 One of the original features of Mucha's posters was his habit of working from photographs, as many surviving examples show. His paintings have undeniable charm, but he himself was too content with life to express in his work the intense melancholy (or affectation thereof) which pervades the work of his Symbolist colleagues. Between 1795 and 1919, Poland had no official existence, having been divided into three unequal parts under Prussian, Russian and Austrian government. Like many other Symbolist artists from Khnopff to Klimt, Mucha made substantial use of photography. A friend of Nadar and of other major Parisian photographers of the period, he depicted the large-format bellows camera designed for portrait photography that he used in the drawing The Photographic Art. Ingres had already remarked that photography "is very beautiful, but you mustn't say so", and at its invention, photography terrified artists; they threw down their brushes in despair at the perfection with which photographs captured reality. In the 1850s, the many painters who used photography for their work tended to conceal and even deny the fact. Others, like Delacroix, openly admitted using it. Mucha did not suffer the typical dichotomy of the 19th century artist who used photography but was anxious about its relation to art. He loved photography for itself, was a lifelong amateur photographer and made widespread use of photos in his work. For him, the camera was a useful toy that performed the task which Baudelaire scornfully attributed to it, that of documentation, note-book, and timesaver. In the second half of the 19th century, Prussia and Russia began to enforce a policy aimed at assimilating the population. German and Russian became the official languages and the teaching of Polish in schools was no longer permitted. The Austrians governed the southern part of Poland, including Cracow, the former royal capital. Their occupation was less repressive, at least to the extent that Austria did not try to assimilate the Polish population. This probably accounts for the fact that the Symbolist vein in Polish art was largely centred on Cracow. Poland's oppression lasted for over a hundred years, despite a number of insurrections, and inevitably left its mark on the arts. Like other countries similarly oppressed - we might compare Ireland or French Canada - the national language and the national faith helped define and preserve the national identity. Above all, the lack of a true national government meant that Polish identity had to be represented and defended by a "government of souls", and this became the mission of writers and artists. This responsibility is constantly invoked in the writings and paintings of the period; one cannot expect to understand the development of Polish art without some notion of the historical situation. True, Polish representatives sat in the Austrian parliament (and even, at one point, in the Russian Duma), life was not uniformly difficult and the wealthier classes in the Austrian part of the country were not averse to speaking German. Hence the importance assumed by the duty of memory, as embodied in the person of Stanczyk. He was a clown at the royal court in the 16th century, but 19th century literature turned him into a personification of lucid patriotism. The almost "sacred" status of memory also explains why a number of artists and intellectuals sought to return to their "roots" among a peasantry which had, in their view, remained culturally pure. 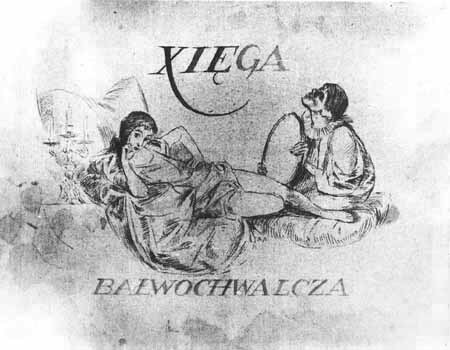 Two of the protagonists of this movement, the poet Lucjan Rydel and the painter and writer Stanislaw Wyspianski, married women of peasant families. These themes are developed in Wyspianski's play The Wedding (Wesele) of which Andrzej Wajda has made an excellent film. Polish artists of the turn of the century travelled as widely as any others, finding their way to Paris, Berlin, Munich and Saint Petersburg. Wladyslaw Slewinski was in Pont-Aven with Gauguin and returned to Poland as the bearer of the good news. But the most striking and dramatic spokesman for Symbolist ideas in Poland was the writer Stanislaw Przybyszewski (1867-1927). 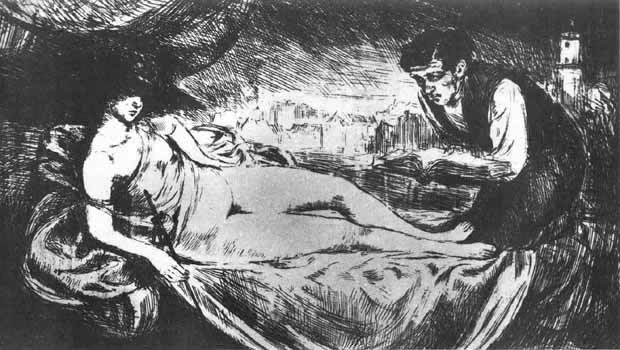 Przybyszewski's features are known to us from Munch's painting Jealousy. He is the bearded figure of greenish complexion behind whose back two lovers meet. Munch, Strindberg and Przybyszewski all met in Berlin; the point of contact may have been Przybyszewski's wife, Dagny Juel, who was Norwegian. She was also a woman of great beauty and both Munch and Strindberg seem to have been fascinated by her. The painting no doubt reflects this situation. Przybyszewski was a poet, theoretician of art, and occasional pianist, who cut a scandalous, not to say a devilish, figure. Borrowing from the repertory of the then fashionable Satanism, he coolly urged those who turned to him for advice to commit suicide. His complicated private life ended in tragedy for Dagny Juel. 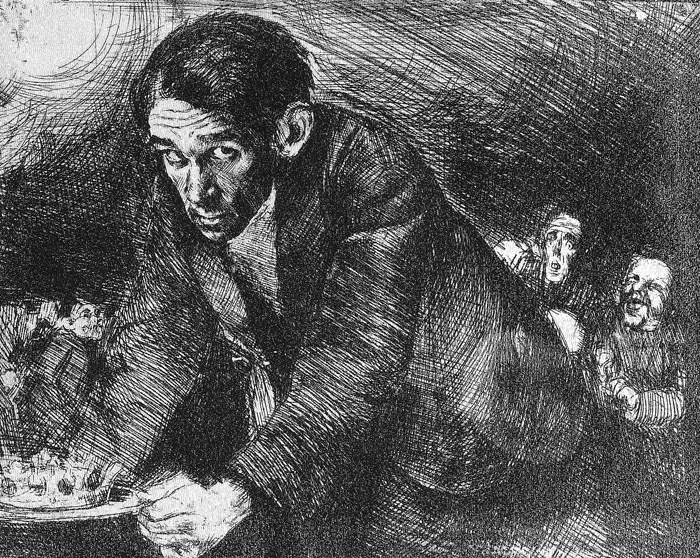 He settled in Cracow when he was thirty (a year after Munch's portrait), and his house soon became known as "Satan's Synagogue" after the title of one of his novels. He befriended Stanislaw Wyspianski and together they founded the magazine Zycie (Life), which became the organ of "Young Poland", an artistic and literary movement. 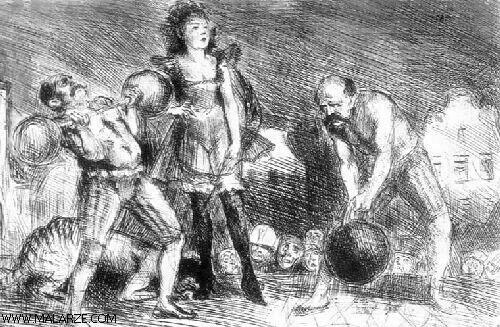 Przybys-zewski was at pains to offend the Catholic sensibility of his compatriots, proclaiming a blasphemous distortion of the famous opening phrase of the Gospel of Saint John: "In the beginning was lust." This led him to a satanist theory of the creation of man and woman. It was Satan, he declared, who separated the original androgyne (a notion borrowed from the humorous myth recounted by Aristophanes in Plato's Symposium). The two sexes thus created have desperately sought to return to unity ever since. We must therefore thank Satan for the joys and torments of sexual desire. Art, according to Przybyszewski, is a reflection of the absolute, and it is the artist's duty to reveal the "naked soul" (naga dusza) and to give utterance to the "cry" of the individual. Whatever the merit in these ideas, the tinsel in which Przybyszewski wrapped them has not worn well and has tended to discredit them. Jacek Malczewski (1858-1929) was a pupil of Jan Matejko, a supremely rhetorical painter whose entire �uvre was devoted to the glorification of Polish history. A similar obsession with history transpires from the poignant works that Malczewski devoted to Poles deported to Siberia. This is the subject of In the Dust Storm; a dust devil on a country road becomes a powerful metaphor for the way in which the memory of the fettered bodies of the deported could surge unexpectedly into the mind. The grandiloquent rhetoric of paintings such as Melancholia (1890-1894) and Vicious Circle (1895-1897) returns to the obsessive question of the nation's frustrated hopes. 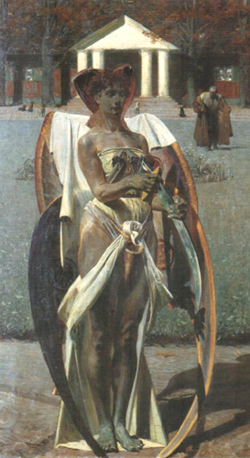 But Malczewski did not restrict himself to this subject, and treated both mythological and Christian themes. Death itself is the subject of several of his paintings. In one of these (Thanatos I), death is represented by an androgynous winged figure who draws an old man out of his manor by running the whetstone over the blade of a scythe. The old man represented is the artist's father, who had died four years before. In another (Death), the angel of death lays her fingers as if in a healing gesture upon the eyelids of the man kneeling trustingly before her. Bruno Schulz (1892-1942) was born in the small town of Drohobycz where he taught drawing after studying architecture in Lvov and art at the Vienna School of Fine Art. 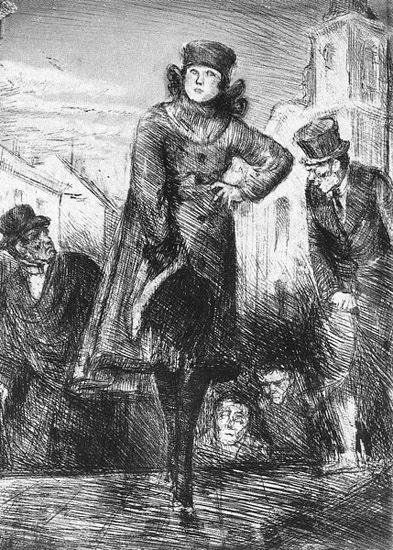 A major author (best known for The Street of Crocodiles), he was also a fine draughtsman and engraver. 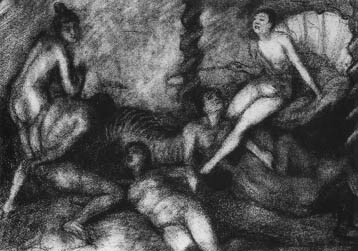 The majority of his work was destroyed during World War II, but the extraordinary sequence of prints entitled The Book of Idolatry (1920) fortunately survived. It is devoted to a single subject - the voluntary humiliation of a man before a woman. It is tempting to seek a clinical explanation for his choice of subject matter and to maintain that Schulz's work merely reflects his fetishistic inclinations. 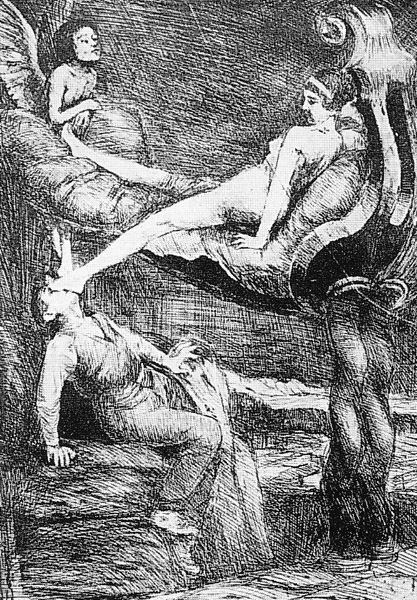 But the quality of the work transfigures this obsession and endows it with meaning, while the subject necessarily evokes the myriad representations devoted to relations between the sexes during the Symbolist age. 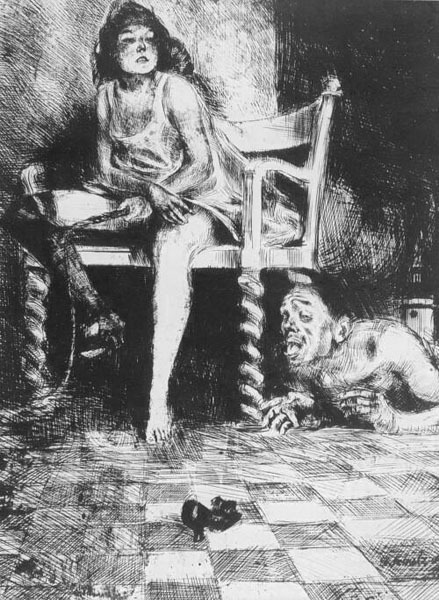 Schulz's work began to appear after World War I, at a time when the Western European public perceived the major preoccupations of the preceding decades as clich�d and moribund. 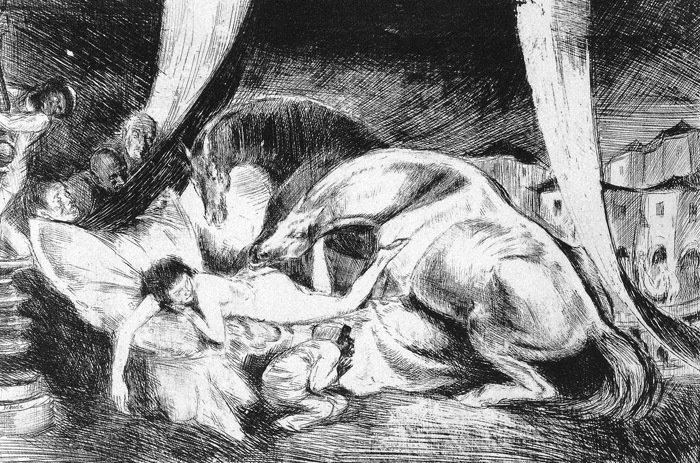 But given his treatment of this central Symbolist theme, Schulz might properly be regarded as the last great representative of the Symbolist spirit.